1.W5100x40 Web Press with 100 ton punch and 34" throat depth. 2.Four F5100x6 Flange Presses with 100 ton punch capacity. 3.Positive hydraulic stripping for both flange and web units. 4.Initial web height sensor (pneumatic). 5.Die clearance retract cylinder to quickly lower the bottom die prior to material movement in either X or Y axis. 6.Three hydraulic Slide Pushers to maintain material against datum line. 7.Servo control positioning in center section to maintain part tolerances (even with short pieces). 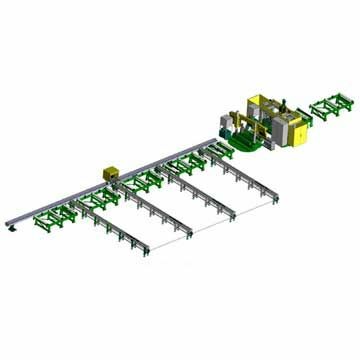 8.Hydraulic servo press positioning for both Web and Flange press units. 9.Vertical Hold-down devices with internal transducers to provide CNC web location. 10.Flange unit moveable with automatic material width sensor. 11.Main table is one piece construction with machine tool type levelers and floor isolators. 12.High volume power unit system with 20 and 40 horsepower options.